Lightweight and robust this stretcher is robust for most removals and it folds neatly in half for easy storage and transportation. Comes complete with straps. Dimensions: 1870mm L x 510mm W x 190mm H.
Weight: 7kg. Max Load: 165kg. Fits into Standard Storage Bag (not included). Also available with folding footstop at £100 extra - call us for more details. PVC coated polyester wipe clean bag with a carry handle and zip closure. Available in 3 types - Standard, Cordura and Corduroy and all fully elasticated to fit over your stretcher. Standard and Cordura styles are wipe clean and Corduroy covers are fully lined. Colours vary by type - see options below. This single height stretcher is simple and efficient and the independent leg operation means easy handling when loading and unloading. Comes complete with a mattress, 2 straps and a standard cover and is available with brake, steering and fixed wheel options. Dimensions: 1930mm L x 580mm W x 780mm H (940mm including foot stop). Min Height: 240mm. Loading Wheel Height: 610mm. Weight: 24kg. Max Load: 190kg. This lightweight and flexible stretcher is manufactured in PVC which is highly durable and hygienic. Wooden slats are built into the construction for rigidity. 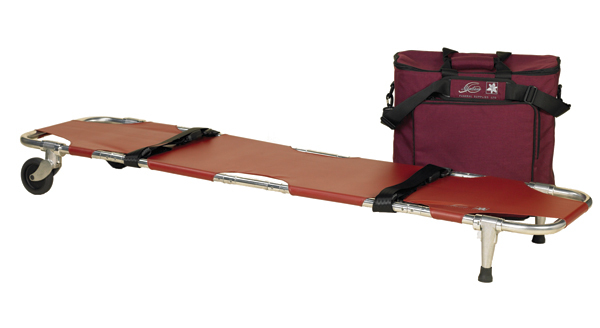 The stretcher has 6 carry handles and 3 internal straps. The standard design of this stretcher is with a zip down the centre, however, if you require a 3-sided zip (u-shape) please contact us. Available in Maroon or Black. Dimensions: 1955mm L. Min Length: 710mm. Weight: 7kg. Max Load: 190kg. With a basket frame to reduce movement on the stretcher. Ideal for stairways and complete with a set of castors at one end. Comes with straps and a standard cover. 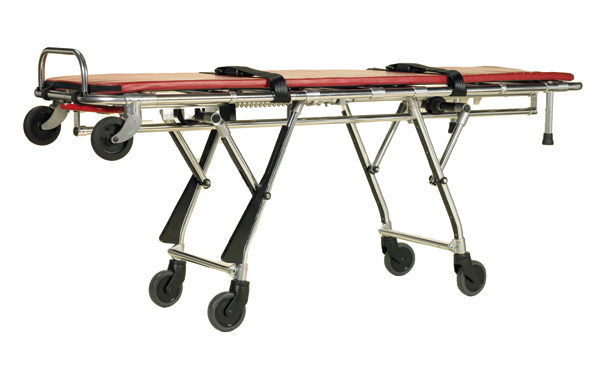 Dimensions: 1930mm L x 560mm W x 215mm H.
This lightweight stretcher is designed to minimise awkward handling. The stretcher separates into 2 halves and enables one half to be placed at either side of the deceased and to then be slid underneath and snapped together to provide a concave surface to prevent lateral movement. Straps and standard cover included. Dimensions: 2000mm L (Min Length - 1670mm) x 431mm x 90mm H.
Weight: 9kg. Max Load: 165kg. A heavy duty version of the 1st Call Flexible Stretcher. The stretcher is manufactured in heavy duty PVC and thicker wooden slats are built into the construction for additional strength and rigidity. Containment is made easier through 5 internal straps and a large zip. Dimensions: 2130mm L. Min Length: 710mm. Weight: 13kg. Max Load: 230kg. Lightweight and compact this is the smallest stretcher available in its class. Comes complete with straps, cover and a heavy duty padded bag for protection and transportation. Dimensions: 1870mm L (460mm when folded) x 510mm W x 190mm H.
Weight: 8kg. Max Load: 165kg. 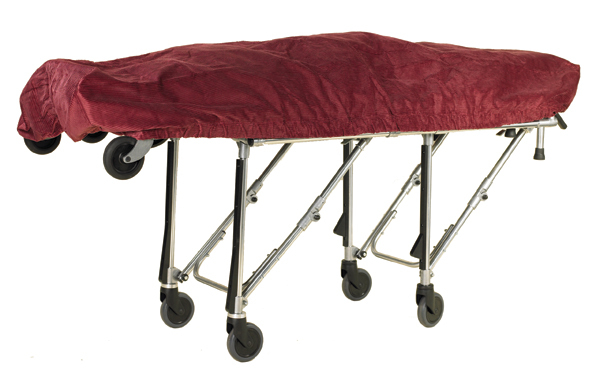 A multi height stretcher providing versatility during the removal process allowing for easy sideways body transfers. The Multilevel ISP comes complete with an interchangeable removable First Call Stretcher which means that removals in small areas is still possible. Complete with a 2 straps and a standard cover and is available with brake, steering and fixed wheel options. Dimensions: 1930mm L x 515mm W x 840mm H. Min Height: 270mm. Loading Wheel Height: 585mm. Weight: 31kg. Max Load: 190kg. 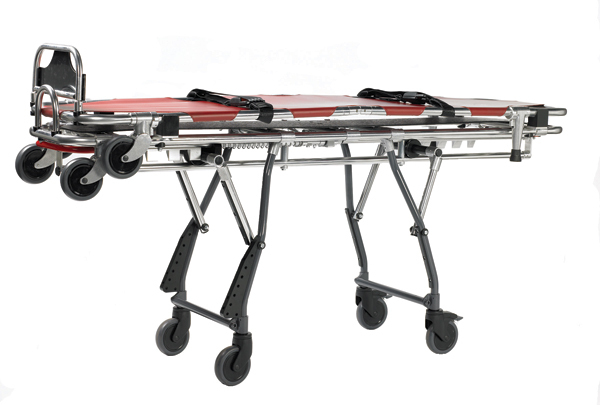 A multi height stretcher allowing safe and professional operation where body transfers can be carried out without lifting. 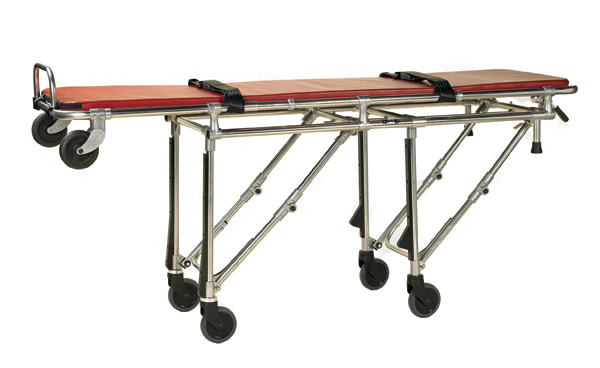 The Multilevel Stretcher can be moved between height positions without assuming the full weight. Complete with a 2 straps and a standard cover and is available with brake, steering and fixed wheel options. Dimensions: 1930mm L x 580mm W x 780mm H (905mm including foot stop). Min Height: 270mm. Loading Wheel Height: 585mm. Weight: 27kg. Max Load: 190kg. Seatbelt style stretcher straps with buckle. Fully adjustable and extremely strong. PVC coated nylon wipe clean mattress filled with 1 inch foam. Dimensions: 1930mm L x 840mm W.